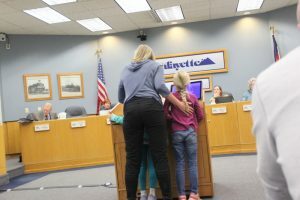 Several speakers at Tuesday’s Lafayette, Colorado city council meeting said that they were ready to engage in nonviolent direct action to keep hydraulic fracturing, or fracking, out of their communities. Speakers from Boulder, Broomfield, Longmont, Nederland, Thorton, and even New Mexico talked about their personal experiences fighting the oil and gas industry and to offer encouragement and support to the community of Lafayette in its fight against having fracking in their community. 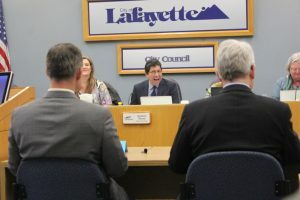 Representatives from the oil and gas industry sat this one out as residents of Lafayette urged – sometimes emotionally – their city council to adopt a Community Bill of Rights Ordinance that was introduced last month. The measure would protect those who choose to resist fracking through nonviolent direct action from the same repression that has been seen at Standing Rock, North Dakota by those fighting the Dakota Access Pipeline. Some speakers raised the issue of the military grade arsenal that has been used against nonviolent opponents to the pipeline including water cannons, flash and concussion grenades, tear gas, and pepper spray. It’s unclear when the council will vote on the measure. 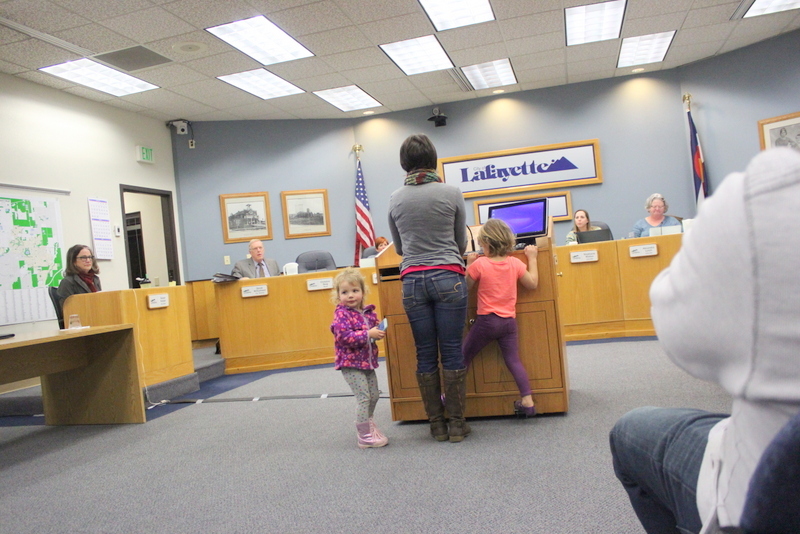 Twenty-three people spoke against having fracking in Lafayette. No one spoke in favor. This is in contrast to the January 17 city council meeting when one oil and gas industry representative spoke. John Olivas, an organizer with the New Mexico Wilderness Alliance traveled from one of the oldest communities in the country to share its more than a decade experience with oil and gas industry coming into Mora County, a community of about 5000 people. The community was the first in the country to ban oil and gas in 2013 and also one of the first to fight lawsuits by the oil and gas industry. Olivas explained that two suits were filed against the county, one by the state on behalf of the Independent Petroleum Association of New Mexico, and another by a private individual. The suits said that the bans infringed on private rights and violated the US Constitution. Royal Dutch Shell filed another lawsuit seeking damages. 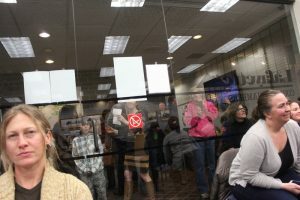 The bans were overturned on technicalities that required a unanimous vote by the county, and a 2/3 vote by the people to be able to ban. Representative Mike Foote and Senator Matt Jones update Lafayette city council on current bills in the Colorado legislature. This entry was posted in Civil Rights, Climate Change/Environment, Human Rights, Politics and tagged fracking. Bookmark the permalink.